Unveiling more, quicker and cheaper than you’d think. Psychometric tools can be helpful additions to any objective assessment process, be it for recruitment or development. They can tap into individual style, motivation, ability or interests. This insight can then be used to inform an interview, provide a focus for development or added self-reflection to develop self-awareness. We find they are most useful when used in combination with other approaches, such as a simulation exercise or with a deep dive interview. 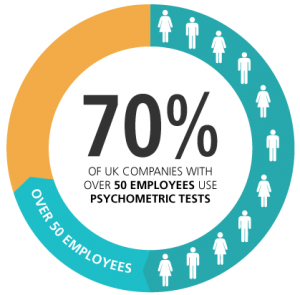 We work closely with a number of psychometric test publishers to select the best tool for the particular needs of our clients. Because we’re independent, we’re free to select the very best tools for your circumstances. We only use tests that have been rigorously developed and empirically researched to demonstrate accuracy, fairness and relevance. The depth and breadth of tools we have access too is extensive, but in summary we can break down these tools into three categories. Personality Questionnaires are psychometric’s that look at behavioural preferences, that is, how you like to work. They are not concerned with your abilities, but how you see yourself in terms of your personality; for example, the way you relate to others, and how you deal with feelings and emotions. There is no right or wrong in behavioural style, although some behaviour may be more or less appropriate to certain situations. Motivation questionnaires can be used to understand which situations may increase or decrease your motivation and help secure job satisfaction. These types of questionnaires aim to determine how conditions found in the workplace could affect your motivation. As with the personality questionnaire, there are no right or wrong answers. Ability tests are psychometric’s concerned with very specific skills. They tend to involve multiple choice answers where this time there is a right or wrong response. Your answers are then compared with a large group of people who have taken the test before and your result is benchmarked against that group.